website of AIIMS for applying the Nursing Officers posts is www.aiimsexams.org. The last date for submitting the online application form is 29-10-2018. The candidates will be selected based on the Computer Based Test (CBT) for this AIIMS Staff Nurse Grade II Posts. 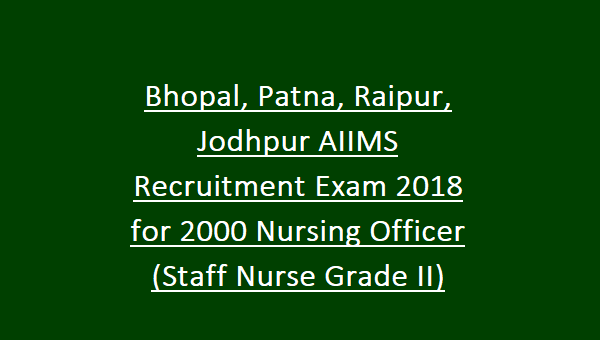 For other details of age limit, salary, application fee and how to apply are given below for the posts of Nursing Officers in Bhopal/Patna/Raipur/Jodhpur AIIMS Recruitment Notification 2018. The age limit for the candidates is in between 21 – 30 years as on 29-10-2018. The upper age relaxation will be applicable for SC/ST candidates is 5 years, 3 years for OBC candidates, 10 years for PWD candidates, 13 years for PWBD+OBC candidates and 15 years for PWBD+SC/ST candidates. The educational qualification for the candidates is B.Sc. (Hons.) Nursing/ B.Sc. Nursing or B.Sc. (Post-Certificate)/ Post Basic B.Sc. Nursing form Indian Nursing Council recognized Institute or University. Diploma in General Nursing Midwifery from recognized Board/ Institute. Registered as nurses & Midwife in State / Indian Nursing Council. 2year’s experience in a minimum 50 bedded Hospital after acquiring the educational. The salary offered for the selected candidates is Rs.9300 – 34800/- with Grade Pay of Rs.4600/-. The application fee for the candidates belongs to General/ OBC category is Rs.1500/-, for SC/ST category candidates is Rs.1200/-. There is ne fee for PWD category candidates. Candidates can pay the application fee through online debit card/ credit card/ net banking at the time of form submission. The candidates will be shortlisted on the basis of their performance in the written test/ Computer based test. Online computer based test will be on 07-12-2018. Date for uploading the scheme of Examination is 12-10-2018. The CBT test result will be displayed on 18-12-2018. Candidates will refer in the official notification for the exam pattern and syllabus. 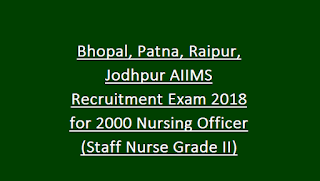 Interested candidates can apply for the Nursing Officers posts through online mode in AIIMS. The official website of AIIMS for applying these jobs is www.aiimsexams.org. The online application forms are available from 08-10-2018 onwards. The last date for submitting the application form through online is 29-10-2018. Fill the application form with necessary details and upload the photo, signature. For more details candidates can check in the official notification.